My old house has a wrap around front porch which is the one architectural feature that gets the most comments from people passing by. It is a great place to relax with a glass of wine on the porch swing. 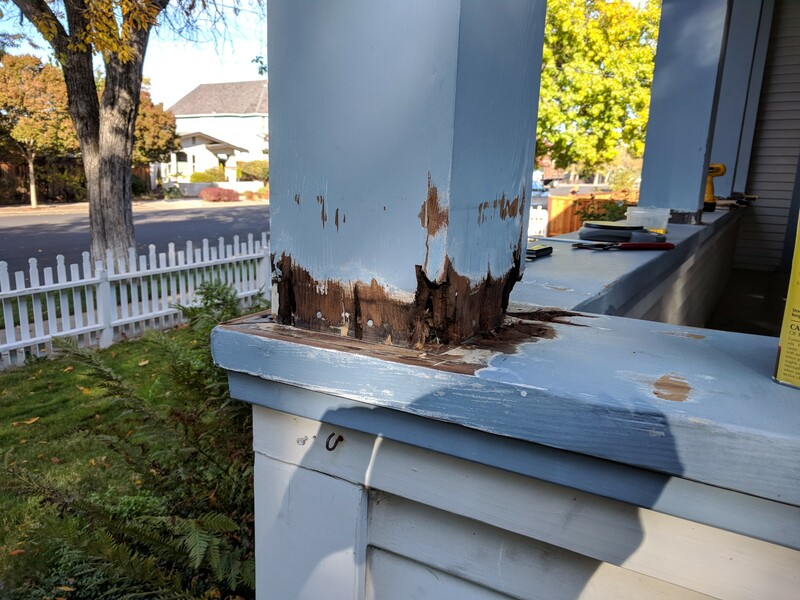 Even with the wide eves, the winter rains and the hot summers take their toll on the porch columns. 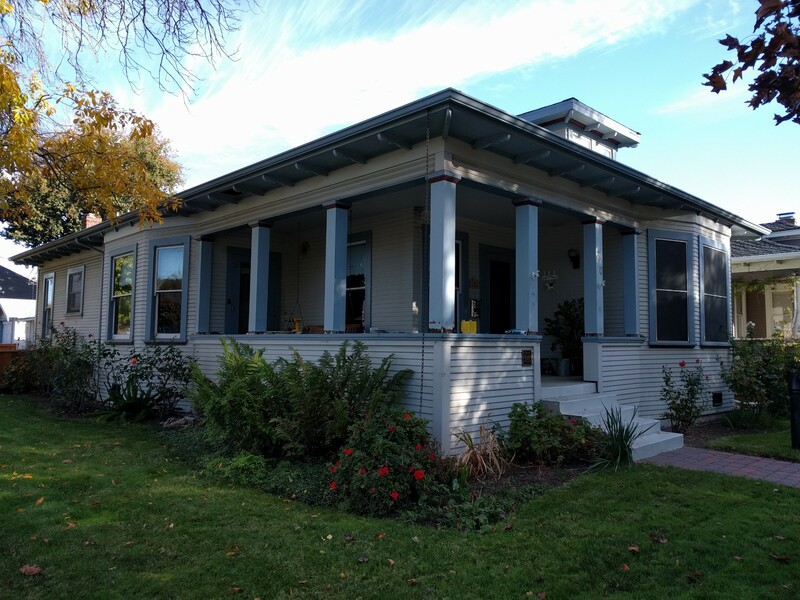 Twenty years ago I restored all of the columns and replaced the crown moldings but the newer woods are not nearly as durable as the Redwood that my house was built with in 1908. Once again I found that water had made its way under the crown moldings and damaged the wood. Fortunately there are products available to repair damaged wood instead of replacing it with materials that are not as stable nor rot resistant. Sunday’s goal was to remove the crown moldings and loose rotted wood. As part of this project I will be adding a fresh coat paint so I sanded around the base of each column before starting the repair process. To repair the wood I am using a two-part epoxy that is absorbed into the damaged areas to consolidate the wood. With the cool temperature it will take a day or so to set up. I will then use a two-part structure epoxy filler to fix the damaged areas. 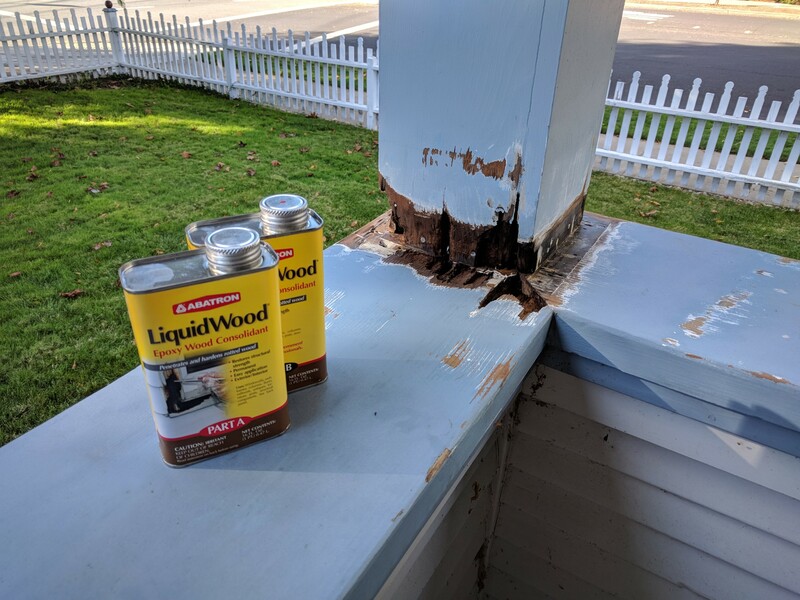 Twenty years ago I stayed true to the way the house was originally built but this time I will utilize modern methods and adhesives with the hope that this repair will last as long as the original Redwood crown moldings.